Moving forward to this election cycle, Mike Fitzpatrick, from Pennsylvania’s 8th Congressional District, has ventured into his own “McCain Moment” when the National Republican Campaign Committee stooped to the lowest of the low. 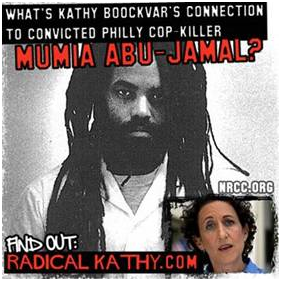 They are attacking his Democratic opponent, Kathy Boockvar, by plastering her picture – with the phrase “Radical Kathy” – on a menacing superimposed picture of Mumia Abu-Jamal, the convicted cop-killer who is in prison for murdering Daniel Faulkner. To spark racial tensions in this community, the NRCC were conducting a robo-call internet campaigns to slander “Radical Kathy,” the candidate who sympathizes with “the cop killer,” or better yet “that black guy.” Mike Fitzpatrick is at a crossroads; he can either denounce the attacks as something extremely ridiculous and as a fishing expedition or he can endorse the attacks by not saying a word. 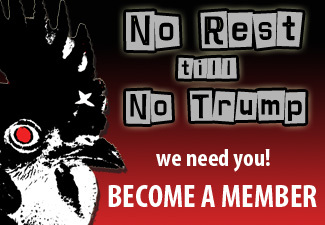 Hello, I’m calling from the National Republican Congressional Committee at 320 First Street Southeast, in Washington, DC, 20003, 202-479-7000, with a recorded message about congressional candidate and legal activist Kathy Boockvar and convicted Philadelphia cop killer Mumia Abu-Jamal. So what exactly is the “connection” between Kathy Boockvar and Mumia? The connection lies with her husband, Jordan Yeagar, who is a prominent Philadelphia lawyer. As Politics PA pointed out, in 1996, Jordan Yeager was the lawyer for Veronica Jones, a witness who testified against Mumia Abu-Jamal in his 1982 trial. In 1996, Mrs. Jones recanted her statement, claiming she was pressured by police. To make an example of how ridiculous this “guilty by association” theme, Wendell Young – President of United Food and Commercial Workers 1776 – released a letter explaining how Mike Fitzpatrick could be “guilty by association” with his local Catholic priests. “Fitzpatrick has launched a despicable campaign saying that 13 years ago, Boockvar’s husband represented a 75-year-old woman who was a literary agent for Mumia Abu-Jamal, convicted 30 years ago for killing a Philadelphia policeman. He also represented a witness in the case in which Abu-Jamal was convicted. According to The Inquirer, the federal prosecutor said the case against the woman literary agent was “almost like a traffic ticket,” and that it “focused only on (her) protest, not on Abu-Jamal’s crimes.” The paper also reported that Boockvar has never met Abu-Jamal. In fact, Boockvar was a teenager when Mumia killed the policeman. The only reasoning for Mike Fitzpatrick to take this route is out of desperation. Mike Fitzpatrick out of touch with his electorate, he stands with Romney and Ryan on rolling back Social Security, Obamacare – which he voted 30 plus times in the past 2 years to repeal Obamacare – and he stands with Romney on the “47%.” A couple of days before this “Willie Horton-esque” campaign was launched, Mike Fitzpatrick made a gaffe regarding “who” we should actually stand up for. According to Fitzpatrick, we should stand up for the “risk taker,” or the “people who signs the front of your paycheck.” Considering there aren’t many people who sign the front of paychecks anymore – metaphorically speaking since most paychecks are automated – it isn’t too hard to figure who he stands with, and it ain’t the working class people struggling in this economy. Mr. Young ended his letter with a nice little rhetorical question for Mike Fitzpatrick to think about: “What’s Mike Fitzpatrick’s connection to convicted Catholic Priest child molesters?’” The answer is as easy as answering what’s the connections between Kathy Boockvar and Mumia Abu-Jamal, it’s nothing. This past weekend, Mike Fitzpatrick wanted to make a non-scheduled campaign stop at the Bucks County Labor Breakfast. The attendees of the meeting had the UFCW’s letters distributed to the local union members who attended the meeting, and before Fitzpatrick made it into the building, he was confronted by Wendell Young. According to Mr. Young, they had a serious conversation about what this racist NRCC attack campaign stood for, and that Congressman Fitzpatrick was worried that those attending the breakfast were had the “Mumia stunt” on their minds. During their conversation, Wendell Young said he brought up that moment that defined John McCain’s character, when he was asked if “Obama is an Arab,” – the blatant racist rhetoric the whole entire spectrum of the right was throwing around during the 2008 campaign. When asked if Fitzpatrick would have his “McCain Moment,” and denounce the Mumia Abu-Jamal smear attack as a racist attempt to gain voters, the Congressman turned his back – like he has to so many of his working class constituents,- walked to his car and drove off. 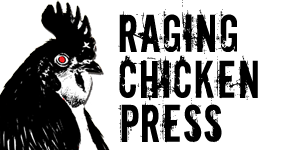 Sean Kitchen is Assistant Editor/Social Media Organizer for Raging Chicken Press. He is a student at Kutztown University.